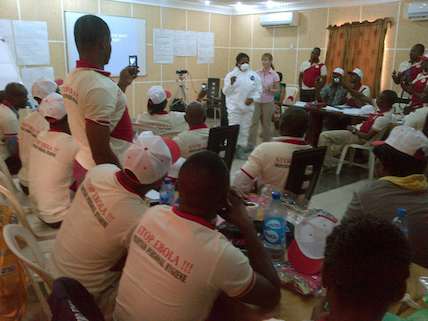 Healthcare technicians in Lagos, Nigeria, watch a demonstration of proper procedures for protection against Ebola. On March 25, 2014, the World Health Organization (WHO) announced an outbreak of Ebola in West Africa. Ebola virus disease, or EVD, is an acute viral disease that is reportedly fatal 90 percent of the time in humans. The first cases occurred in a remote area of southeastern Guinea, near the borders with Sierra Leone and Liberia. The disease soon spread to these neighboring countries, as well as Nigeria. As of August 31, more than 3,700 “suspected and confirmed” cases were known. The death toll had risen to 1,848—more fatalities in six months than in all previous outbreaks of the disease, combined. The largest number of deaths has occurred in Liberia. The current Ebola epidemic, which is the first the world has seen, threatens to become a global concern. The number of cases is increasing rapidly. The WHO and the U.S. Centers for Disease Control (CDC) are warning that Ebola might spread to other continents and are calling for an urgent international response. Efforts by the health ministries of the four affected countries are failing to contain the epidemic, and health workers trying to treat those afflicted with the virus are themselves falling victim. No licensed vaccine for EVD exists, but pharmaceutical researchers are hoping to rush one to market. The National Institutes of Health recently began testing an Ebola vaccine on human subjects. At least one promising drug is being readied for use in treatment. The eruption of the disease in West Africa came as somewhat of a surprise to health officials. Although occasional Ebola outbreaks had occurred since 1976, when the first human case was documented, EVD had been seen mostly in isolated circumstances, in the Democratic Republic of the Congo, Sudan, Congo, Gabon, and Uganda. This article describes the dire Ebola crisis; includes links to related stories. This CDC webpage is devoted to the Ebola epidemic; includes archives of updates back to the initial announcement of the outbreak; includes a map showing the affected areas. This WHO factsheet explains what EVD is, its symptoms, history, and how it is transmitted. This video explains the urgency of the Ebola epidemic in West Africa, which threatens to spread to other continents. This article explores the implications of efforts to develop an Ebola vaccine. This is a big problem. If I was there then I would be freaking out! I am pretty sure the U.S. is protected enough .-. it might bring the down fall of the u.s.a.
why is there no cure for this? Because it has yet to be invented. It’s a pretty recent outbreak and these things take time and money. well, they are working on a cure. its mixed with cow DNA and human immune DNA or something. this is alot of reading!!!!!! A lot of reading? It’s like,3 paragraphs…I read a 500 page book a day on the weekend! well…and they say I have a short attention span. u would care if you got Ebola! This seems very much like a shock article. They’re spinning all the negatives and wording it especially so that everything looks apocalyptic and deadly. Yes this strain is more deadly than the others of its kind. Is it treatable? Probably, just give it time. Dang…has anyone made a cure in case it comes back? They said they’ve pretty much fixed it on the news, didn’t they? this is just terrible how ebloa spreads around the world..
how did ebola get here in the first place.Can you people make it stop before it gets to my family and friends or me i am trying to go to college and get a good job and make money to support my family who supported me all my life. I think scientist should be working on finding a cure to Ebola. I just think it ridiculous that it is taking so long to do it.